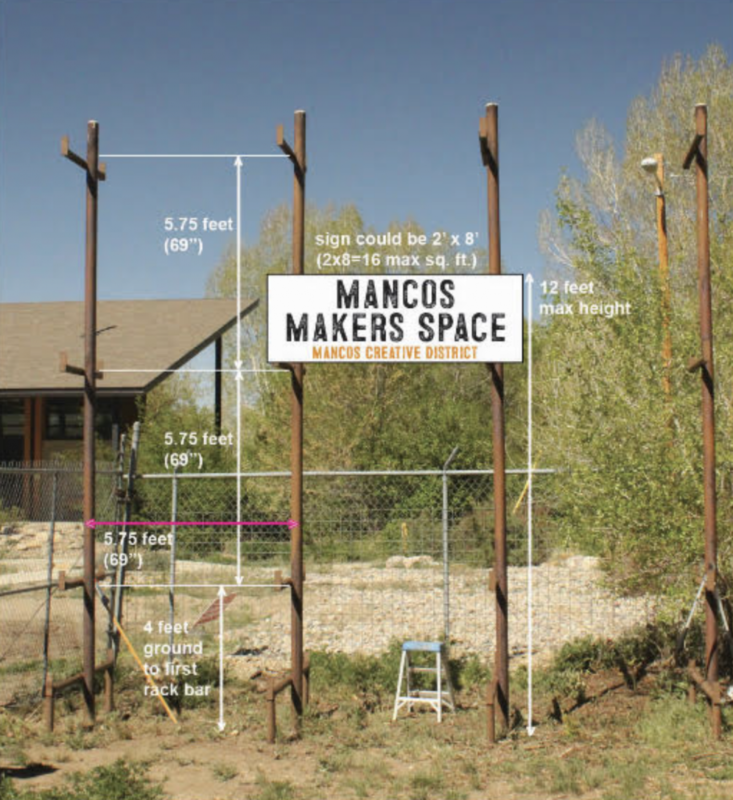 The Mancos Creative District is accepting proposals from qualified artists for a Mancos Makers Space sign. Proposals will be received no later than August 15, 2018, 5:00 p.m. to Jodi Jahrling, Executive Director, Mancos Creative District, jodi@mancoscreativedistrict.com. Proposals received after the above date and time, or in any other location other than via email to Jodi Jahrling will not be considered. The Mancos Creative District reserves the right to reject any or all proposals when the public interest will be served thereby and to waive technicalities and informalities. Space Background: (Photo below) The Mancos Makers Space, a community gathering and teaching space is located in the back lot of Alpaca Rafts in Mancos, CO. The entrance is located through a chainlink fence that can be accessed via the Mancos Public Library parking lot. A space for signage is available using old lumber pipes for attaching the sign. This space is maintained and scheduled by the Mancos Creative District. See photo below for dimensions. Project Purpose: The Mancos Creative District, is soliciting for qualifications and proposals from qualified artists to design for the construction of a sign for the Mancos Makers Space to be viewable from Main Street, Mancos, Mancos Public Library and Mancos River bridge. The design should include the words: Mancos Makers Space. The design should include pricing for creation of the sign and any applicable artist fees. The design should fall into the minimum or maximum size so that it may be able to be affixed properly. Design Guidelines: It is anticipated that designs should emphasize creativity and learning. Lighting should also be considered, but not mandatory for this stage. Proposed designs should be proportionate to the site and not obstruct traffic sight‐lines. Landscaping, if proposed, should require minimum maintenance. The successful artist will show structural soundness, integrity ease of installations, maintenance, quality of the structural design and proposed materials. Understanding of project as demonstrated in the proposal including conciseness and thoroughness and identification of issues and approaches/solutions. Ability to provide design services with a final lump‐sum total price. Design/implementation schedule and availability to immediately begin project. Identified conflicts of interest and/or resolution of same. Final selection of the artist will follow a two‐step process. First, the qualifications and costs provided under this RFP will be thoroughly reviewed with the top artist(s) selected by the Mancos Creative District Board of Directors. Second, the top artist(s) may be interviewed by the Mancos Creative District Board of Directors and the finalist selected. The price is of importance to the Mancos Creative District, but may not be considered the priority in the final award of the contract based upon other criteria. The cost provided is to be a “not to exceed” lump sum cost. Responses received after the close of business on the specified due date will not be considered. The Mancos Creative District reserves the right to short‐list (up to 2) artists for more detailed technical proposals or schedule interviews with the short‐listed artists. The Mancos Creative District reserves the right to select the second ranked artist if negotiations with the first artist are unsuccessful. The Mancos Creative District will administer the project.